The new documentary “Making Modern Charlotte” shows how four businessmen reimagined their city. Two were bankers. One was a newspaper publisher. 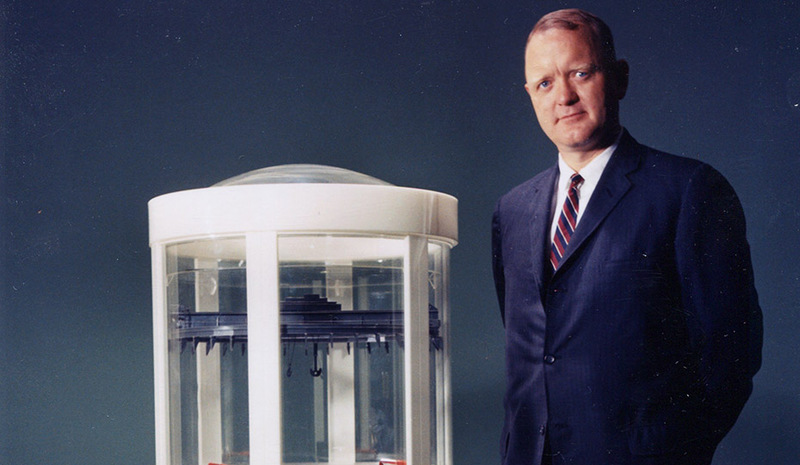 And the fourth was Bill Lee, the CEO and chairman of Duke Power Co.
Bill Lee with a model of the Oconee Nuclear Station reactor in 1969. They were known as “The Group” and, in many ways, their vision in the 1980s shaped Charlotte into the city it now is, the nation’s 17th largest, a banking hub with an international airport and major league sports. In the film, Lee is described as someone who could get things done with the simple arch of his eyebrow. Other members of The Group were Hugh McColl, CEO of NationsBank (now Bank of America), Ed Crutchfield, CEO of First Union National Bank and Rolfe Neill, publisher of The Charlotte Observer. Ruth Shaw, who was CEO of Duke Energy from 2003 to 2006, is interviewed in the film about Lee. Watch the “Making Modern Charlotte” documentary here.